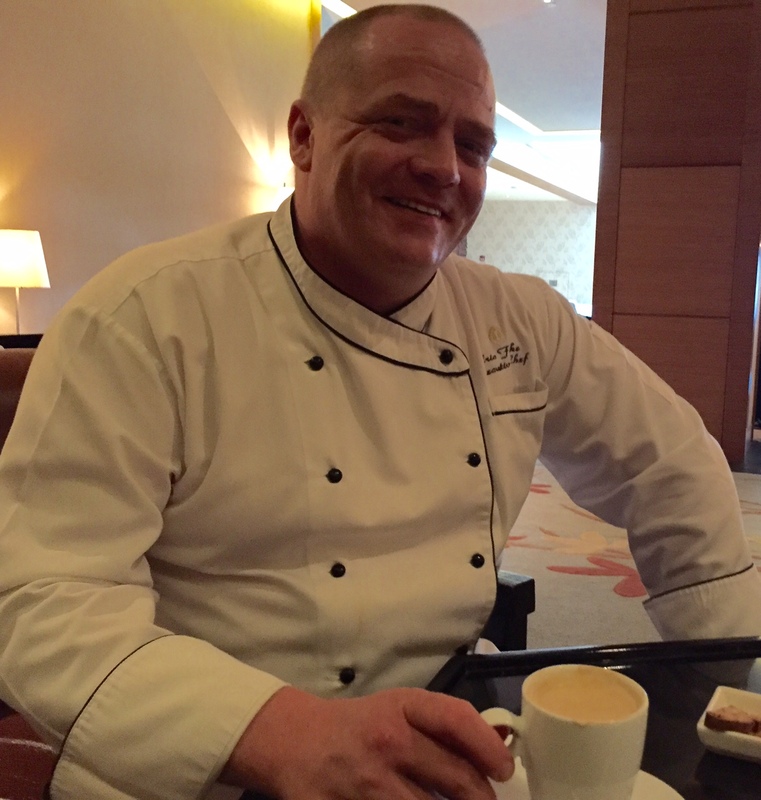 This cuppa was with Eric Fettke he shared his insights into Bun Cha that he often shares with friends when in London and the lucky diners of the InterContinental Hotel, Asiana Saigon Ho Chi Minh City, Vietnam; where he works as Executive Chef. He kindly shared with me not only a few of his favourite noodle recipes he shared with me some of his likes and loves of noodles which he has accumulated over time living in Danang, Hanoi – Vietnam, Joburg – S.Africa, Poland and Aqaba – Jordan. Discussing interesting dishes noodle soup based, Chef Erics favourites are: Bun Cha and the Cha Ca both from Hanoi. 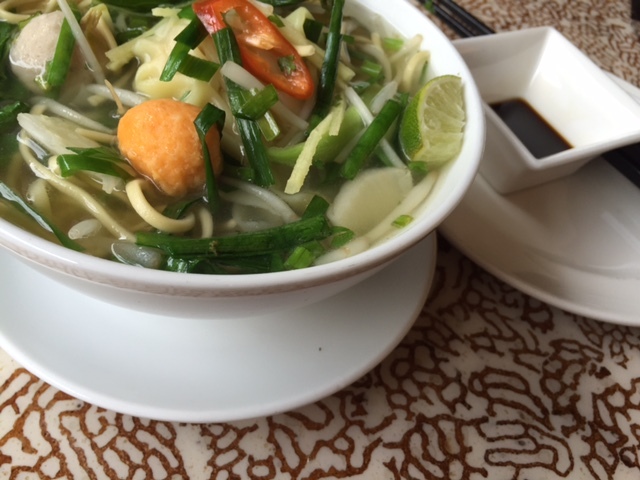 Whilst I traveled through the South of Vietnam through Saigon, Mekong Delta and Hoi An I sought out tasty noodle soups so we swopped many stories of tasty soups and his favourites and he shared some recipes. The Bun Mien made from rice flour which is fantastic to watch being made as the cooks will use a cloth with holes in squeezing it into the water – obviously there are some big machines also used but this way it can be made to the quantity needed, squeezed into the hot water and then it is scooped out and used after 2 mins cooking and when it rises scoop them out. 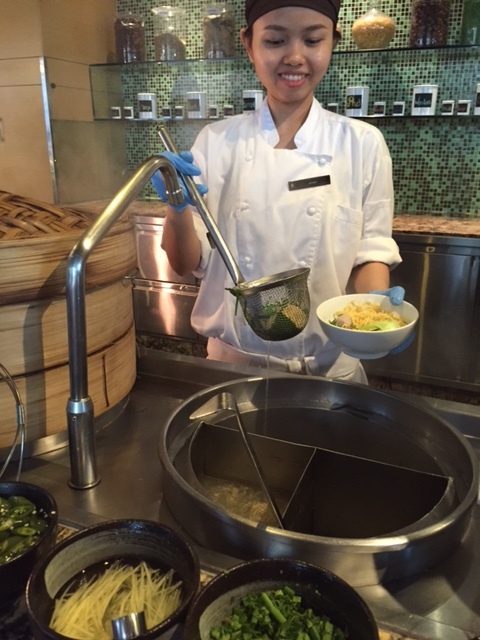 Unlike the Chinese process of where they pull the noodles the Vietnamese noodle process is quite different. The Bun Cha would be with the rice noodle and served with two types of pork (pork belly and the pork shoulder that has been ground into patties that have been marinated with onion, lemongrass, chili, black pepper and fish sauce. The marinade would be the same for both and the meat would be cooked on charcoal to give a smokey flavor and caramelise. There are two ways of eating noodles either dry or wet. (i) A bowl of wet noodles (ii) A bowl with room temperature stock (Bun Cha water which is a base made up of fish sauce and water, garlic and corabean carrot, all cooked together to make a sweet and spicy. (iii) A bowl of Vietnamese basil, parilla leaves, shredded lettuce. So you basically add the noodles to the stock, which has the meat inside, and you take some of the herbs and eat it like that. In the North of Vietnam this would be served with a fried spring roll, and inside they would have the same type of noodle, with minced vegetables, Vietnamese black fungus mushrooms, all deep fried and the spring roll will go into the stock. So as you eat it intensifies the flavours which is lovely and probably the number 1 dish. The Cha Ca also uses the Bin Mien rice noodle. It is a fish dish marinated with galangal, fresh turmeric root, chopped dill, cooked on the BBQ and while cooking add more dill and onions and finish it together with some fish cooking sauce and some toasted shallots and crushed peanuts. So you would eat it by having your bowl of Cha Ca, eat with your fish together but it would be drier with the fish sauce being more of a dressing like soup. Cha Ca – Check out Cha Ca La Vong an authentic restaurant in the old quarter of Hanoi – this is the most famous place in Vietnam, it is a very low key place so don’t expect fine dining crockery J – A bucket will be brought to the table filled with charcoal and you will make your own meal at the table. In Hanoi there are plenty of good Cha Ca places but this is probably the best for tourists. The Bun Rieu from the Mekong Delta area is not one of Erics’ favourite dishes; it is made with the thicker noodles made from Tapioca and wheat flour, whilst the noodles are fine the stock has a lot of shrimp paste inside with tomatoes and pigs liver; the thing is Eric stressed the importance of knowing where the pigs liver came from and how it has been treated. Mi Quang It is a very Chinese influenced dish with egg noodles served with either beef or seafood (Mi Quang Hi Son). Depending on where you eat it the dish will vary slightly in the South everything is sweeter. In the north the food seems to be a lot cleaner and nicer. What is very popular now is the noodles are deep fried with a thick sauce that is poured on top for you to enjoy which is really nice. In Hoi An there is Cao lầu (my husband’s favourite noodle dish only found in Hoi An), is a must. As it is very different –it has a mix of influences from the Chinese and Japanese, urban legend has it that Cao lầu noodles derived from the Japanese Soba noodles as they use a flat noodle similar, this is flawed due to there being no buckwheat in the noodle. On the other hand some Chinese wheat noodles are similar to those used in Cao lầu though made with rice flour. Traditionally this noodle soup is made with sliced pork (Cha Siu), local greens, including Vietnamese mint and the best thing about this soup is that it has a wonderful crunch added with rice crackers sprinkled on the top. new restaurants with modern versions have added shrimp or chicken, and additional herbs. And the pork broth is sometimes blended with dried shrimp/squid or chicken stock. The only consistent item are the noodles. So if you see Cao lầu noodles, then you have Cao lầu. Fried fish with turmeric, dill and rice noodles. Method: Cut the fish into cubes 2cm x 2 cm and place in the marinade. Rub in well and allow to marinade at least 4 hours. In a hot pan, add enough oil to cover the base and fry the fish. Oil should always be a little more as this takes on the marinade and will be part of the dressing when you serve it. When 90% done add the spring onions and dill and remove from the heat. Serve on a platter and add some of that lovely flavored oil, topped with the peanuts and serve the noodles and sauce separate bon the side. Noodles should be warmed slightly; dipping sauce can be room temperature. — Eric loves this dish and its super fast to prepare if your entire mise en place is ready. Garnish: Crisp salad leaves – Lambs lettuce, Cos Lettuce, Fresh coriander, Fresh mint, Fresh Thai basil, Crushed roasted peanuts, Crispy fried shallots. Method: Slice the beef strips into julienne and marinade the beef with half of the lemongrass, half the garlic and fish sauce. In hot wok/pan sauté onions, the remainder of the garlic and the lemon grass, add the beef and sauté with the white pepper and a pinch of salt. Place the noodles into a bowl, add some of the fresh herb leaves and salad leaves, next place the beef on top, dress with about 125ml – 150ml of the nouc cham and complete the garnish with more herbs, fried shallots, and roasted peanuts. This dish is hot beef, warm noodles and warm dressing – Doesn’t need to be piping hot. You use the dressing in the bowl to coat the noodles and eat with the beef. 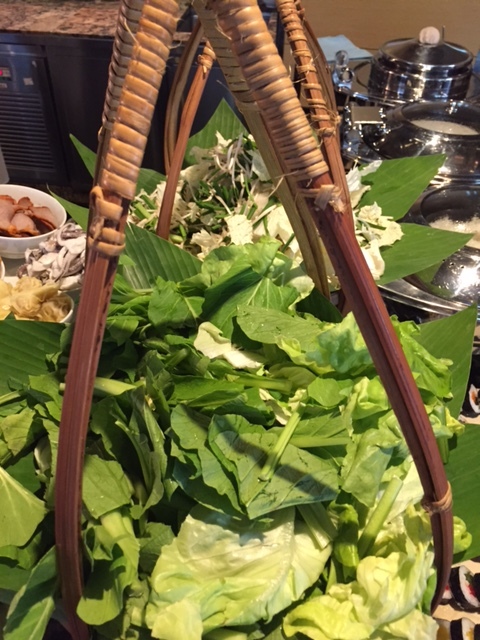 Garnish : Crisp salad leaves – Lambs lettuce, Cos Lettuce, Fresh coriander, Perilla leaves, Vietnamese Basil leaves, Additional thinly sliced red Thai chilies, Bean Sprouts. Method: To make the marinade mix the sliced spring onions, shallots, fish sauce, caramel, salt and white pepper in a bowl. Add the smashed onion and leave for 30 minutes pour half the marinade over the pork belly, keep the smashed onion with this and mix half with minced pork. Form small patties with the mince. For the sauce, use the nouc cham add freshly crushed black pepper, carrot and Kohlrabi to the mix, warm through gently as not to upset the balance of sweet and salty. Grill the belly and patties until nicely caramelized. To serve: Place the meat on a platter; give each person their own bowl of noodles, nouc cham and lettuce, herbs, sliced Thai chili and bean sprouts. To eat you place some of the noodles, herbs, lettuce, sprouts and meat into the bowl and eat it like you would any noodle dish adding more herbs, sprouts and meat as you go along. Pho Bo: (National dish, beef broth with beef and herbs). To Garnish: Fresh coriander, Bean Sprouts, Julienne spring onion, Sliced red Thai chili, Thinly sliced onion julienne, Chili sauce, Lime wedges. Method: Rinse all the bones well, bring to a simmer and skim off all of the scum and oil. Boil for 20 minutes until clean. While this is boiling place the cinnamon, onion, star anise and ginger under the salamander and give it a good heat to almost “burn” it. It should be starting to go black, careful, cinnamon and star anise need a lot less time than the ginger and onion. Place the clean bones in a pot with fresh water and any leftover stock that you might have from the previous batch of pho. Add the aromatics, a little magi powder and the fish sauce and allow to simmer for at least 12 hours. While this is simmering place the brisket into the stock and allow it to cook until done. Remove and cool, slice on a slicing machine. Strain the stock and keep warm, a couple of droplets of fat on top is perfectly acceptable. Place the Banh Pho in hot water, strain and place into a bowl. Add the sliced beef brisket, some freshly sliced “raw” beef and next the stock to cover the meat. Top with sliced onions, julienne spring onions. Serve the chili sauce and lime wedges separately for the guests to add, as they like. To Garnish: 150g Bean sprouts, Crispy fried shallots, Fried garlic – Cut lengthways very fine and fried until crispy in about 160 degree Celsius oil, Chopped Thai red chili, Fresh coriander, Fresh dill. Method: Dissolve the tamarind pulp in warm water, “massage it well” to ensure that all of the flavor is released. Strain well to remove all little bits and the seeds. Combine with the fish stock. Fish sauce, pineapple and sugar in a large pot. Add the tomato fillets and sliced okra and bring to a gentle simmer. Add the fish “steaks” and cook through. Remove the steaks. Place the noodles in bowls, top with the delicious broth making sure that each person gets tomato fillets and pineapple. Top with the fish steaks, bean sprouts, fried shallots, garlic, coriander and dill. Marinade the beef in a bowl in the fridge for at least 30 minutes, the longer the better really. Soak the glass noodles and mushroom sin warm water to rehydrate them, strain and place into a bowl. Cut the glass noodles into 4cm strips. Cook the steak, should be medium maximum unless it’s an issue, allow to rest and slice. We always prepared this in advance and just shaved the beef into very thin slices and placed onto a plate by the pass for 2-3 minutes. Mix the sliced beef with the rest of the ingredients and dress with just enough of the dressing to evenly coat the salad. Place in a bowl or plate and garnish with the fresh herbs, roasted peanuts and crispy shallots. Sounds quite over powering but actually a unique brilliant taste. If you like cut back a little on the shrimp paste. It’s a labour of love but so worth it!! Garnish: 1 Small bunch spring onions, 2 Small bunches of mint, Bean sprouts, 400g Fresh rice noodles or rehydrated as per the packet instructions. Method: Dissolve the shrimp paste in water and allow steeping for at least 2 hours, straining the liquid well. While this is steeping marinade the pork leg and beef shin in with 1 cup of the fish sauce for about 1 hour. Stir fry the onion and spring onion in a little oil for 2 minutes, remove and wrap in muslin cloth with the cinnamon, cloves and black pepper. In a clean pot place about 5 liters of water, the rock salt, remaining fish sauce and the oxtail and bring to the boil, skimming to remove the impurities. Once boiling, reduce to a simmer and leave to simmer for at least 30 minutes. Add the beef, pork, lemongrass, leek and half of the mint to the pot and simmer for an additional 90 minutes. Remove the meat form the stock. Add the shrimp paste stock from earlier and allow to cook for another 90 minutes, it should all be reduced by about half now. Strain carefully through a muslin cloth. In traditional Vietnamese cooking with fish sauce is normal practice and this is not recreated each time it is purchased — why reinvent the wheel when it is already available on the shelf. As long as the quality is good that is the important thing. Remember the people on the street are using this daily selling about 3-400 portions so they use store bought fish sauce. It is not some fancy extraction process. For those that have a gluten free diet note: as long as the noodles are made with rice flour there shouldn’t be an issue. E.g. 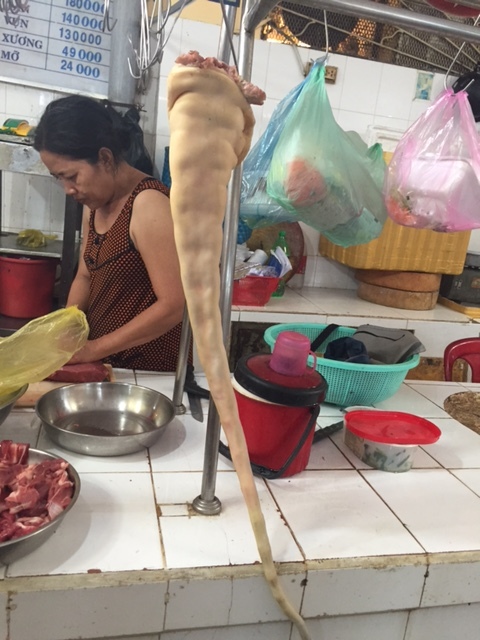 the Bun Mien which is the thin noodle similar to vermicelli and greyish in colour and when cooked it becomes translucent, this is also known as cellophane noodles. In Hanoi they use the mien noodles and fry them with crab and vegetables. You can put them in a soup or a stir fry and you can use the normal rice noodles that go into the Bu Mien and the Cha Ca a famous dish is Canh Ca Chu (hot and sour fish soup with a whole tomato, some spice) as long as you know what is going into the stock. Sometimes with the street food they use MSG powders because it can make 10 litres 15litres and in that 5 litres is potentially another 30 bowls so the traders revenue increases. You can understand why the traders use it but you don’t have to agree with it. Because MSG doesn’t have a distinctive flavour sometimes you simply don’t know if it has been included. Great Catching up with you Petra, Glad you enjoyed your time here in Vietnam and thanks fior the oppertunity to share my passion about noodles with you !!! It was my pleasure. Hope to catch up should you come to Melbourne.